A year after it bought Skype, Microsoft released a version of the popular Internet calling service for Windows Phone devices that is half baked. Skype for Windows Phone shed its beta label this weekend, but even for enthusiastic users, the app could be a deal-breaker for its lack of background calling ability and its incompatibility with lower-end handsets. At first glance, Skype for Windows Phone works just like the iOS and Android clients. You can make calls over 4G, 3G, and Wi-Fi; make low-cost calls to landlines and mobiles using Skype credits; or manage your contact list and chat with friends. 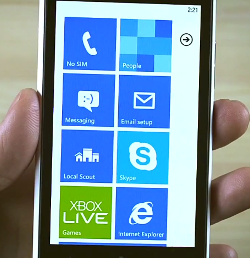 Using the Metro UI, Skype for Windows Phone looks very slick, too. However, the app has a few drawbacks. First, you need a Mango (7.5) Windows Phone with 512MB of RAM, which means the VoIP app works only with high-end devices on the platform. Less expensive Tango (7.0) Windows Phones with 256MB of RAM, such as the Nokia Lumia 610, can’t run it. Skype for Windows Phone requires use of a Nokia Lumia 710, 800, or 900; an HTC Titan or Radar; or a Samsung Focus S or Focus Flash. Skype for Windows Phone’s biggest drawback is that it lacks the ability to receive calls in the background. If the Skype app is not in the foreground, or if you’re in another app, you won’t be able to receive calls via the Skype app. To even answer a call, you need to have the app in the foreground, which undermines the utility of the app. This omission is especially apparent as rival service Tango Video Calls already offers this functionality on the platform. A few smaller issues linger, too. Bluetooth headsets are not yet supported for Skype calling on Windows Phones. The app won’t work if the phone is connected to a computer with the USB cable. With version 1.0, Skype also says one of the known issues is that incoming calls, alarms, or low battery notifications may end a Skype call. At last count, the Windows Phone Marketplace has more than 70,000 apps, still a far cry from Apple’s 500,000-strong App Store and Google’s 450,000 apps in Google Play (formerly Android Market). While the launch of Skype for Windows Phone ticks another box on Microsoft’s list of popular apps missing from Windows 7 while present on other platforms, the first version of Skype for Windows Phone defeats its purpose of offering low-cost calling over the Internet, since the app doesn't support low-end devices and you can’t receive calls in the background.